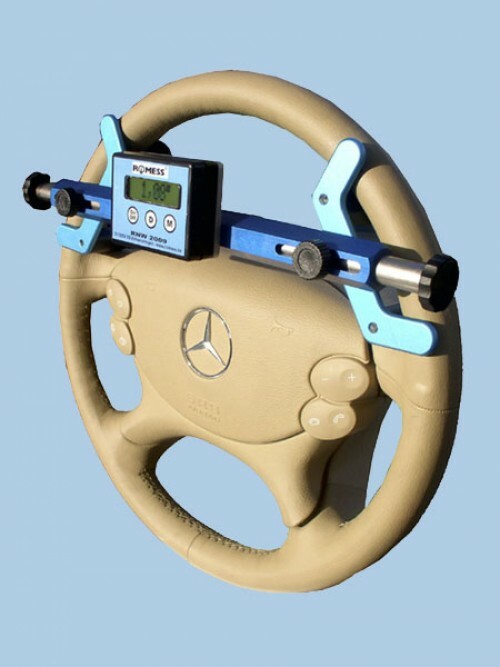 The steering-wheel adjusting balance with electronic inclination RNW 2009 is fitted in the interior of the steering-wheel with a bearing device protected by utility patent with 4 usage bolts in the interior of the steering-wheel according to its diameter. Two strong springs ensure the firm hold of the steering-wheel balance in the steering wheel. The actual angle position of the steering wheel is displayed immediately. This value can be transferred for the analysis to a computer via USB-interface. The steering-wheel adjusting balance with electronic inclination RNW 2009 displays the actual angle values of the steering-wheel. Voltage supply: built in lithium-ionic-accus 910 mAh fast charging module. *) Data format/protocol can be customized.